How do you feel about goody bags and open bars? I feel pretty good about them. 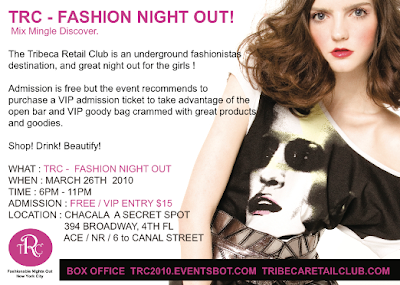 Enter the Tribeca Retail Club's Fashion Night Out. Fashion Night Out is an independent designer trunk show, shopping and beauty event. An underground fashionistas destination, it showcases a variety of independent designer duds, beauty products, and services. Admission is free, but a VIP admission ticket scores you an open bar plus the VIP goody bag valued at $150. VIP ticket holders can also take advantage of designer discounts and services all night! VIP ENTRANCE : $15.00 gets you Open Bar & VIP Swag Bags. UPDATE: If you use the discount code “KATHARINE,” it chops the cost down to $10 entry instead of $15. The code is good through midnight, MONDAY, March 22. Only 8 tickets are left under my code!